Oh do I have a fun treat for you today. It showcases one of my old favourites – carob. Have you tried carob powder before? The pods of the tropical carob tree contain a sweet pulp which is dried, roasted, and ground into powder form. Carob is caffeine-free and contains antioxidants as well as calcium, iron, potassium, and fibre. I love mixing a spoonful of it into my vegan overnight oats, banana soft serve, homemade almond milk, or tossing some into a smoothie for a natural sweetener. I usually buy it in bulk from Bulk Barn (a great way to sample it if you are on the fence), but certain brands like Bobs Red Mill also sell it by the bag in many grocery stores and you can also find it online. carob powder is naturally sweet which reduces the need for a lot of added sweeteners in a recipe – a total bonus if you ask me. If you can get over the fact that carob doesn’t taste like chocolate, you are golden. Some people say carob has a flavour similar to dates. I think that’s a better comparison, but you really just have to try it for yourself! In this recipe, I paired carob with a touch of cocoa powder to add some chocolate flavour. You really can’t go wrong when these two powders are combined as you get the sweetness from the carob and the rich chocolate flavour of the cocoa powder. Of course, if you want to skip the cocoa powder all together you can do that too. 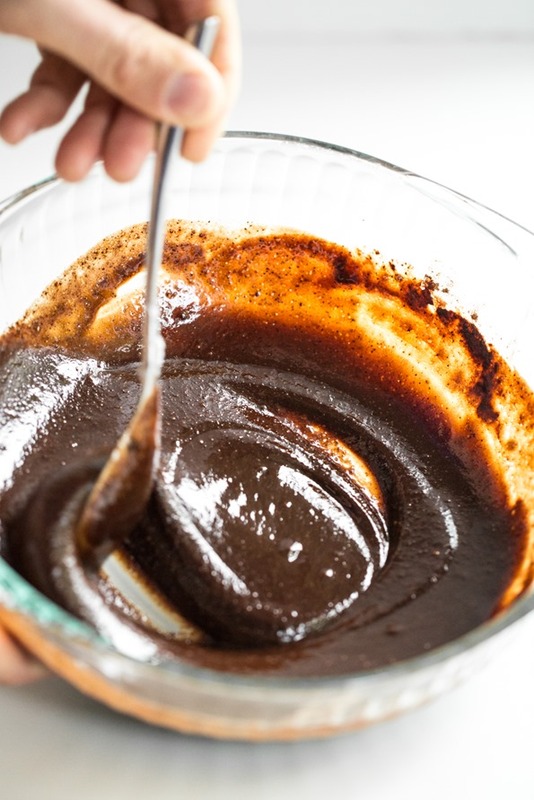 Or if you want to use all cocoa powder you can try that, although you’ll need to add more liquid sweetener to the recipe to make up for carob’s lost sweetness. I worked off my favourite Seductive Raw Chocolate Walnut Freezer Fudge and this carob variation was born. This recipe has a fraction of the added sugar (about 75% less), but I promise you won’t notice anything is missing. Now that’s my kind of treat. Best of all it takes 10 minutes to whip up and only another 20 minutes to set in the freezer. The only downside is that the hubby keeps eating it all on me! Ready in 30 minutes, this carob freezer fudge is low in sugar while still tasting quite decadent. Feel free to change up the nut butter, sweetener, and mix-ins as you see fit. The coconut oil is necessary in this recipe though as it helps solidify the fudge when chilled. It melts quickly so be sure to enjoy it straight from the freezer and don't let it sit on the counter for more than a couple minutes. Line a very small loaf pan (4" x 8") with plastic wrap for easy removal. Mix all ingredients together in a large bowl until smooth. With a spatula, scoop the mixture into the prepared pan and smooth out. Freeze for about 20 minutes, or until solid. Slice into squares and enjoy! Store leftovers in a container in the freezer as it melts quickly at room temperature. 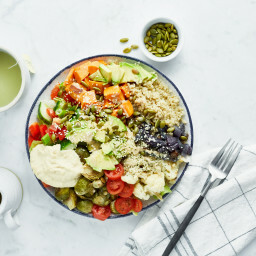 pssst – Bonus recipe alert! 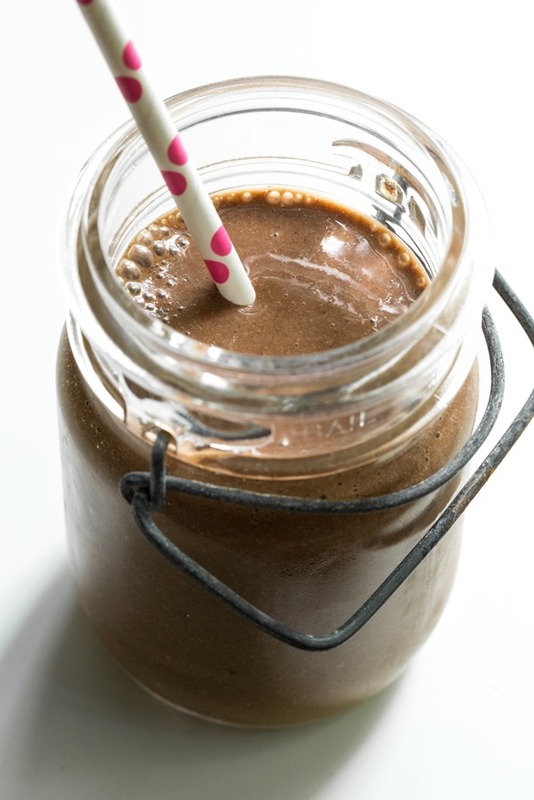 Carob powder makes a healthy “frosty” too. Just blend 1 large frozen banana, 1 1/2 tbsp carob powder, 3/4 cup almond milk, 1/2 teaspoon vanilla extract, 1 tsp cocoa powder, 1 ice cube, and 1 tbsp chia seeds until smooth, icy, and thick. Absolutely delish! It reminds me of the Wendy’s frosty drinks of my youth. Holy yum! The Mr will flip for these! I can’t wait to surprise him with it. If I only have cocoa powder, can I use that instead of carob powder? You sure can, but you’ll probably need to add more sweetener to make up for the bitter quality of cocoa powder. Just add to taste and you should be good! I used cocoa instead of carob and chopped pecans instead of the rice crisp cereal with no more sweetener than 3 T of maple syrup, and it was delicious! This is a FANTASTIC recipe! Super easy and delicious… the perfect amount of sweetness for everyone who has tried them so far… Highly recommend! I agree with Kathryn’s comment – this fudge is insanely delicious and so easy to make! I actually like it better than chocolate, which I didn’t think was possible! I too give it a five-star rating. I love the taste of carob! I have gestational diabetes so I won’t be eating these for the time being (although if I left out the rice puffs and paired it with protein it might work…not worth the risk though), but I’m pinning these to whip up for when I get some kitchen time at some point post-partum…they look amazing. Carob? Never heard of it! Eager to give it a whirl. I love freezer fudge, so this has got to be great! I love how easy this looks! O man! This looks delicious and so easy. I can’t wait to try this treat. Ooh looks delicious!! I must get myself some carob! Yum! These look perfect. Pinned and can’t wait to try them! This looks beyond amazing! I love the combination of almond butter and chocolate mm! I can’t believe I’m craving carob right now! Freezer fudge is dangerous because it’s so easy I make it ALL the time! This looks delicious :) But I kid you not, a PB freezer fudge recipe has literally taken over my life. I should be careful! Both of these treats sounds amazing. I must try the smoothie asap. I love a cold refreshing drink! I have never tried carob powder. It is one of those things that is on my list to try. I like that it is naturally sweet. I didn’t know that. These look fab, especially with the addition of cripsy rice cereal. It reminds of the cripsy cakes I used to make when I was younger. I’ve NEVER made freezer fudge before either. What is wrong with me??! All you had to say was “easy” and “fudge.” Yes, please! 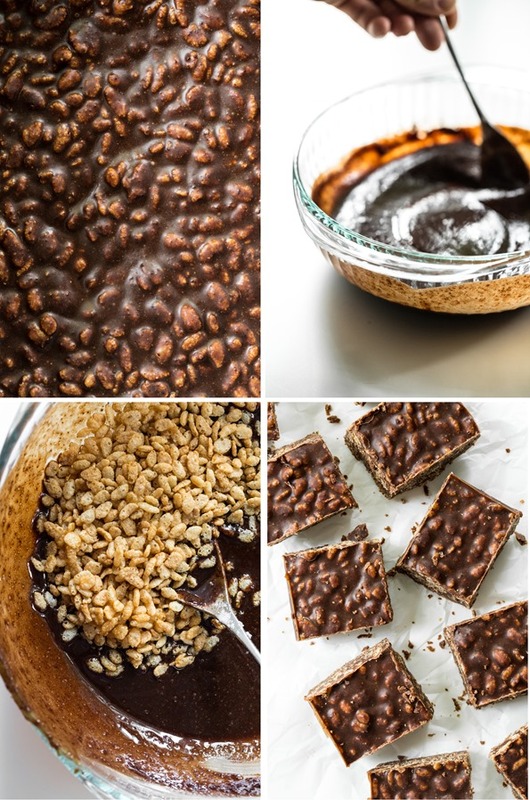 This looks incredible and l love switching things up and using carob. Great recipe! I absolutely adore carob, and this looks similar to a few less neat mixes I’ve thrown together. Your version is far more professional! Oh yes, this recipe is a keeper! My kids and husband will go crazy for it! I’ve never tried carob before but this sounds like a really great way to do so! I can never quite get my head around the carob taste, perhaps mixing it with cocoa powder will help :-) thanks! Yum, carob! A bakery near my old place used to sell these amazing carob-chip cookies, which definitely got me on board with carob. Carob fudge sounds super tasty. I find myself wanting to visit your pantry – just to see what you keep on hand. Would you consider giving us a tour and listing of your favorite vegan pantry staples? I’ve never actually heard of carob before but this looks amazing! It looks like such a yummy treat that I would enjoy! This recipe looks like a great treat to cool off on a hot summer day. I have tried caco nibs, but have not experimented with carob powder yet. I am looking forward to trying it out with this recipe. Thanks! Ohhhh, I LOVE carob! This looks so good and super crazy easy, definitely need to make this… and yes, the frosty too. YUM! I have to update… I’ve made these twice now! They are so, so rich and delicious. The 1st time I used 2 tbsp of maple syrup. The 2nd time I only used one (and I’m thinking of using none the next time around… They just seem sweet and rich enough without the need for added sweetener). I also added some chopped up raw almonds to the batter and then sprinkled some course sea salt on the top. Oh my goodness. Addicting! Wow! Will have to try carbo soon! Made the frosty with Valrohna cocoa powder, and it was amazing-and very, very chocolate-y! What a great summer alternative to a milk shake or malt!! This sounds delicious! How would you substitute using carob chips though? Is it even possible? love the crispies in this! I definitely want to try this with a touch of cocoa cocoa powder so i dont miss the chocolateyness to much, looks delicious and so easy a quick too. Trying it tonight! Looks so amazing! I cannot wait to try it out! I just purchased your book and love all the recipes I’ve tried thus far! It looks delicious! I don’t have crisp rice cereal, but I enjoy a crunchy texture. Is there anything else you would recommend adding in place of the cereal? I used puffed millet. I think puffed rice would work too. I think you could take some rice cakes and chop them into little pieces and use them. I picked up Bob’s Red Mill Carob Powder – reader beware – it can make quite the mess! I’m not sure if it is because the powder is super fine, but I realized fairly quickly that I wouldn’t be able to store it in the original package for too long without everything in my pantry getting a fine dusting of carob! I’m super excited about this recipe! I recently purchased raw cacao powder, so I think I will add that in along with the cocoa and carob powder. I’m finding with pregnancy that my chocolate cravings are becoming more of a daily thing than a “monthly” thing lol. Made it! Wou is delicious ….another wonderful recipe , thank you Angela! Oh. My. Drooool! Just made these and they are awesome! I have to say, though, that I made some swaps to what I had on hand and to alleviate some pesky allergies I have. I used half the amount of cocoa powder and subbed in some instant hazelnut coffee powder for the rest. And I used chopped hazelnuts instead of the rice crisps. In this tragic turn of events I have been experimenting with carob powder, but I have found it very, very hard to balance. In fact this is one of only two recipes where I feel like I’m eating chocolate and not a substitute. omg! I need to try these :-) yummy in my tummy… and the smoothie looks delicious also! Made this today. Incredible! I was debating about whether to use the cacao I had or buy carob and decided to buy the carob. I have always liked the flavor and this recipe doesn’t disappoint. I liked the carob so much in fact I added it to a frozen banana smoooooothie. Deliciousness! Oh my! This look so freakin’ gooood! These are delicious but how do I stop the rice crispie cereal pieces from just floating?! Oh my gosh this looks like an amazing swap for a crunch bar! I love it! I just made these and had to come on here to thank you for posting this recipe! These are absolutely delicious!! They are also so very quick and easy to make. Would be a great recipe for the kids to make I think! For anyone concerned about carob, these are going to make you fall in love with carob, even if you are currently not a fan. Yesterday, I made your two layer raw chocolate brownies for our Breastfeeding Week Picnic. Apparently they were the hit of the event. I was sitting at a table where a lady was asking “who made these? who made these?” When she got to me, I was able to tell her about your website! Plus they were perfect for my friend who is celiac! She often doesn’t get desert at potluck events. Thanks for the great recipes! Thanks for the frosty recipe! I tried it this morning, and it was so yummy! I’m glad I can have a frosty too! It does remind me of Wendy’s, and what a great idea to mix the carob powder and cocoa together. It works really well. I just made this. I purchased carob powder yesterday after seeing the recipe. I questioned whether I would like it due to the smell but it is YUMMY! I definitely like the crunch factor with the crispy rice! 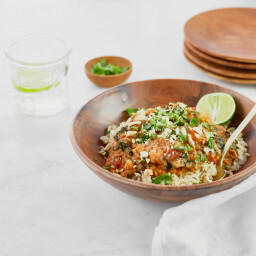 Just printed the recipe and making this tonight. :) So excited! I love the way you describe carob. It makes me really wish I wasn’t allergic to it! This fudge is beautiful. I may try it with cocoa powder, and add more sweetener if needed. Mmmm. I’ve been craving chocolate lately. This looks like a satisfying and healthy way to indulge that craving. I’m especially pumped about the frosty idea! I love carob! Just made this lovely smoothie for brunch. 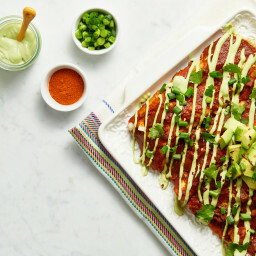 This looks so delish, can’t wait to try! Ohmygoodness… why did I have to see this right now when I’m SO hungry. It looks so so so good. I’m going to give this a try soon and I’m sure my 2 year old will love it! Nope. Not this one. Tasted like a lump of chocolate oil. Felt like a rock in my tummy. Mostly I’m a fan but not this one. Hey Angela, I’m so glad you tried it out and loved it too! I’m glad I’m not the only one who thinks it tastes like the Wendy’s frosty :) I used to eat those alllll the time growing up, hah. I just made this and it was SO good. This will definitely cure my chocolate cravings for the next week or so. Thank you! Yum! Made it just now and used chopped pecans in place of the puffed rice. 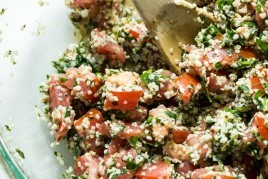 Very rich but delicious and super easy! Love that it is just a little bit salty. Don’t think it will last long! I made this! So easy….and SO good! I have never used carob before, but I liked it. Now onto the frosty…. This looks amazing! I loved that walnut freezer fudge you made, and your crispy rice bars, so this looks like another must- try. I really like carob (although I have chips and not powder) but I agree it is not quite like chocolate. These look amazing! I’ve been looking for something new and delicious to stock my kitchen with! Might have to give these a go sometime this week. Great blog! I have made twice and amazing! such a fantastic recipe! Thanks for another fun recipe! P.S. I bought your cookbook today. The photographs are beautiful. I can’t wait to dive in! Oh this is incredible, we finished it all in a day and I’m thinking about making another batch now. It’s very very addictive. As Angela mentioned, I ate most of these almost immediately. I highly recommend! I can’t wait to try these! I have all of the ingredients except the cereal and the carob powder. Any suggestions on where to purchase the carob powder? Hi Karen, I linked to it online on Amazon in the post. Also many grocery stores carry it now in the natural food section or even at Bulk Barn. I made this in no time at all. I have a serious love of chocolate and this definitely satisfied my after dinner craving. Made this today, loved it! The flavors work together really well! It is a bit rich though, but my toddler loved it! Toddler approved, just so you know! Made this a couple of days ago and the whole family loved it! I used cocoa powder instead of carob, simply because that is what we had on hand. Look forward to making it again! Both of these recipes are fantastic! I made the frosty today and it is irresistibly delicious! I even added 3 tablespoons of hemp seeds for protein and couldn’t taste it a bit. I made the fudge a week ago and we’re both hooked. It is very yummy but much richer than I am used to and is strictly for nibbling. Is there anyone who thinks 1/4 cup applesauce could be subbed for 1/4 cup of the coconut oil? Would that ruin the texture when it froze? I whipped these up in about five minutes flat. I used cocoa powder because I couldn’t find carob powder (wah wah wah!). I also used chocolate puffed rice (because really, you can’t ever have too much chocolate). I put them in a mini cupcake tray, and there you have it: single servings of complete awesomeness. They were A. MA. ZING. Thank you! Did you have to line the cupcake tray to keep the from sticking or did they pop right out? I love this idea! Love this! I had forgotten about carob — I was totally into it when I thought I could live without chocolate. Once I came back to chocolate, I avoided it and now I have found it again thanks to you! The recipe was great, I will make it again and again! These are delicious! I didn’t have cocoa powder so I substituted Tbsp coconut sugar. I also sprinkgled shredded coconut on top before putting it in the freezer. Had no carob and used cacao instead as mentioned. Lovely! But I will go looking for carob since I will make it again, definetely! For me, the crunch is a must! Much better than store-bought chocolate ( I am neither vegan nor vegetarian). Made these for a gathering I was having for my husbands birthday . They went faster then the store bought cupcakes I also had :-) . Super easy to make ! Easy to make and delicious! Satisfied my chocolate craving! I really love these, but my kids and husband did not like the strong coconut flavor. They are asking me if I can substitute another (healthy) vegan ingredient in place of the coconut oil? I made them with refined coconut oil and loved them, I’ve added a lot more of the brown rice puffs to make it less fatty. Then I tired them with virgin coconut oil and hated them, they had a very strong aftertaste. I’ll stick with non virgin coconut oil. I think the quality of the coconut oil make a big difference. I find a lot of the cheaper coconut oils are often rancid from sitting on grocery store shelves for too long. Go for a slightly more expensive brand of extra virgin coconut oil. It should have no after taste at all. I went with only one spoon of sweetener and puffed amaranth instead of rice crisps. Little did I know that I was just 30 minutes away from this yummy and healthy treat!! So fast to put together and love the crunch that the crispies give! :) LOVE IT! I needed to make a quick dessert for my kiddies. They loved helping me make these (and eating them too of course) with a couple of adjustments. I added about 1/4 cup chopped walnuts, only did 1 tbsp of carob and 2 tbsp cacao and a few drops of stevia to sweeten it a little more. Still very dark chocolately in taste with a kick of sweetness. Yumm!!! Our dessert for the next few nights. Thanks for the quick recipe!! And that seductive walnut fudge is like my go-to fudge! I used peanut butter in place of almond butter and doubled the recipe since I was making for a group BBQ. I was nervous about the plastic wrap, but it worked perfectly and didn’t stick :) these we such a hit!! The rice crisps added a great crunch. No leftovers sadly! This was so super easy to make and I already had all the ingredients! I used cocoa powder instead of carob and I left out the rice crisp cereal (because I didn’t have any!) so it was just straight fudge! I’m not a huge coconut fan but I didn’t mind the flavor in this. It’s super silky and creamy and chocolatey! Oh my goodness! This is so good. I gave up chocolate several months ago and have been using carob in everything. So I was thrilled to see your recipe. I just didn’t add the cocoa powder. This is the first freezer fudge I have ever made and I love it! The first time I made it (3 days ago) I used peanut butter, so yummy. Today I made another batch using cashew butter. Next time I’ll try the almond butter. Very dangerous. I want to eat the whole batch! I have never used carob before, but I made these without the cocoa and they are very decadent and rich. They satisfy my sweet cravings for chocolate for sure. I will try it with cocoa next time. I can’t imagine them without the rice crisp cereal! This was quick and easy. These look amazing!!! I cant wait to try these! At the moment I don’t have carob powder but I have unsweetened carob chips… could I use these as a substitute? Made these yesterday and just had the first bite. They are orgasmic. These were amazing. I used straight cocoa powder as it was on hand. These didn’t last long. Another winner, Angela! I love carob, but haven’t used it in ages. This is a great recipe. I actually substituted cocoa butter for coconut oil, and the mouthfeel is so amazing! I just ate way too much of the batch on my own, but will be making these again for sure. This are both delicious. I am new to using Carob to satisfying my chocolate cravings. This works! Yummy!! Hubby and I loved this! 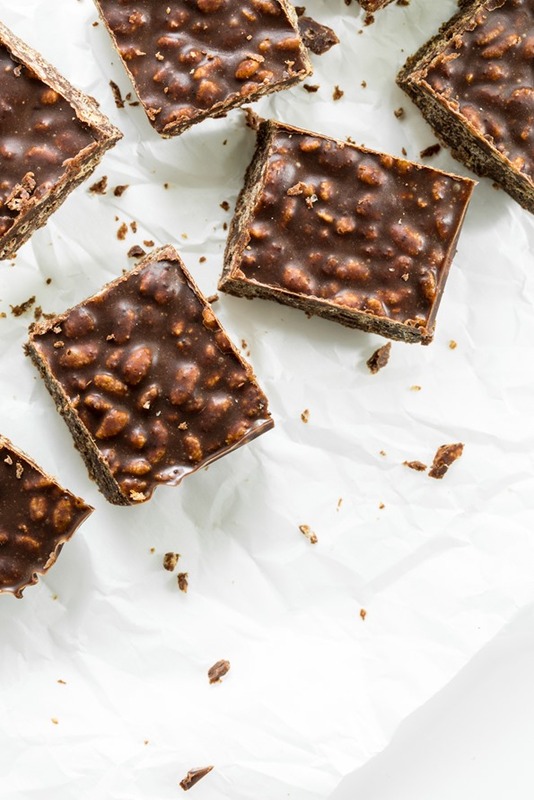 Quick and delicious- very similar to a Crunch bar but much healthier! These are amazing!!! So rich and filling. I’m making my second batch tonight! Loved this so much I had to email it to myself to always have it. Thank you so much for sharing this! to die for! very rich and satisfying!!! I just made this, so easy and so delicious!! My husband never had carob before and loved it. I used 2 T maple syrup, 1/4 c. coconut oil (by accident, but it worked), 2 T. of chia seeds and a handful of crumbled vanilla chex cereal. I froze for about 30 min and it was the perfect texture and sweetness. Thank you! my kiddos is allergic to coconut. suitable substitutions? butter? avocado oil? They look delish! Looks like perfect recipe to make for my family. PS- i was introduced to your blog after receiving your cookbook as a gift. i’ve made many recipes from the cookbook and your blog- all have been excellent. 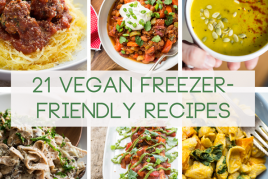 you’ve made ‘vegan’ so accessible, even for someone like me who is not vegan. Thank you! I grew up eating my grandmas delicious carob fudge during the holidays, it is still hands down my favorite dessert ever. Tasting carob inevitably reminds me of her. It took me years to start liking chocolate, and to this day I still prefer carob. I can’t wait to trythis recipe. Did you use raw or toasted carob powder? I made these and they are amazing. I doubled the recipe and used peanut butter instead of almond butter. My friends loved them as well. Very satisfying if you need a chocolate fix. I made these late night and they are so good. I couldn’t find carob powder anywhere though, I substituted melted carob chips and it worked well. I like how they aren’t overly sweet like traditional fudge, but can kill a chocolate craving still! I’m allergic to casein and was looking for a dairy-free alternative to Crunch bars. The ones I’ve seen in the store have been a bit pricey and smaller than a typical candy bar. These were even better! I had to wait until I got a chance to buy the carob powder at DeKalb Farmers Market on a trip to Atlanta, since a lot of things are cheaper there. I didn’t have almond butter, so I used peanut butter instead. Addictive is all I have to say! Never heard of/tasted carob before, and found this recipe looking for delicious fudge alternatives. Decided to give it a try. 8 batches later … I’m addicted and so are my family members. We are all die-hard chocoholics, so this is saying something!! I also am addicted to this! My friend, who has Diabetes, loves this! And it does not raise her blood sugar, if you use honey! These are so good! I now make them every week for my husband and I. The “frosty” is also regularly in my smoothie rotation-even adding spinach to it works well! Thanks! Lesley, how does that taste? When you add spinach to your frosty? Have you ever tried any other greens, like kale? Thank you so much for this fudge recipe. I cannot eat chocolate– it is a migraine trigger. This is the first totally non chocolate dessert that I find really is chocolatey that I can eat a whole bunch of without worry! I don’t use any cocoa in the recipe, just keep it all carob. Thanks so much for giving me an easy, delicious and indulgent treat option. This is a GREAT recipe. Just a bite of chocolate at night hits the spot. Double cuz it will be gone. These look amazing, Do you know where you can buy carob powder? Greetings! Thank you very much for this recipe: it is too delicious! Little rough when you don’t have a gall bladder, but worth it :). Subbed in a salt free roasted smooth sunflower seed butter for the almond and it was fantastic. Used the full amount of maple syrup and salt, with raw cacao powder: salty sweet to the max :). 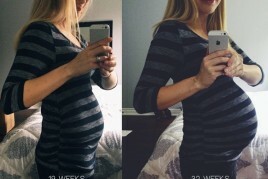 Congratulations on your little one! Love this recipe! I double it so I always have some on hand. Chelsey, why don’t you try soy bean oil? Most vegetable oils are soybean oil. Check the label. Hi Angela! I rate this as a 10! I have been trying to get off Chocolate, because of the double amount of caffeine (caffeine & theobromine). This is perfect! I did change the recipe a little, though, I left out cocoa, used honey, instead of maple syrup, increased peanut butter to 1/2 cup, and added 1/4 cup unsweetened coconut flakes. P. S. Love all your recipes! Keep posting new ones! Will it still be good if I freeze it for a whole day? 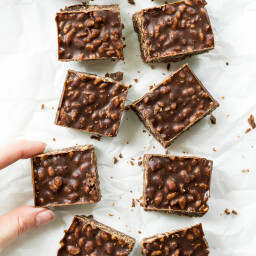 Hi Im intrested in making Easy Carob Almond Freezer Fudge + Frosty Recipe but my daughter is allergic almonds what else could I used besides creamy natural almond butter ? Thank you for this recipe. I just made it, so delicious! Tried it with almond butter and peanut butter and I think it’s even better with peanut butter! Just love how easy this recipe is! This recipe sounds great but so many of these clean food recipes use almond butter or a similar nut butter. What could I replace it with so people who are allergic to nuts can enjoy these. I think tahini would be far too over powering. Does anyone have any ideas please? Sunflower seed butter should work. It tastes a lot like but butter but seems ok for those with nut allergies. Hi I would like to make this with cacao powder rather than carob! Do you have any idea how much cacao I should use? Thanks! I just made your carob frosty. Oh my! Thank you so much! This might become my new dessert. I added a couple of Medjool dates only because I had started making another recipe and then discovered I didn’t have all of the ingredients. But, Yum! I didn’t have frozen banana and I can’t wait until next time to freeze my banana first. I might let it sit a bit, too, to let the chia gel, if I can wait that it is. I appreciate the carob recipes, and look forward to trying the fudge. This was delicious and super easy to make. I used cocoa powder instead of carob powder and puffed millet instead of puffed rice and it was fantastic. Even my picky husband liked it! a few days ago I made this fudge – it’s delicious! (I’m from Germany and don’t use a cup to measure so I took way too much rice, but still it was very tasty) I’m so happy I found this recipe because I try to eat as less cocoa as possible. I suffer from neurodermatitis and quit eating sugar, milk, wheat and spicy things. Thank you for your recipes and your inspiring work! I’ve never made a recipe comment before, but I had to express my gratitude for this one! I’m recently on an anti-inflammatory diet for health reasons, mourning the loss of chocolate and sugar in my life, and have been struggling to find dessert recipes that aren’t just like “heat up an apple and pretend.” I took one bite of this freezer fudge and almost wept with joy. Thank you. For folks in similar situations: I left out the cocoa powder and subbed 2 tbsp brown rice syrup for the maple syrup. Had never tried carob before, but the effect was plenty chocolatey for me. Thank you for sharing your substitutions Sarah – I’m sure they’ll be super helpful to and appreciated by other readers, especially those in situations similar to yours. I’m also so glad to hear the recipe satisfied your chocolate and sugar cravings. :) Wishing you all the best! I made this this morning, but instead of using coconut oil, I used coconut butter that I’d made from dried coconut. It seems to be staying solid in the fridge, and I’m fairly sure it’d be ok at room temperature. Though I doubt it’ll be around long enough for me to test the theory. *I poured the mixture into muffin tins lined with paper liners. *I used peanut butter instead of almond butter (it’s cheaper). *Instead of rice krispies, I used Nature’s Path Amazon flakes, which I crushed with a rolling pin. *I used refined (tasteless) organic Spectrum coco oil. But the basics are there, and thank you so much!!! Angela do you use raw carob? I’ve also see dry and lightly roasted available. Thank you! Hi Julie, I use roasted carob…I don’t think I’ve seen raw before! Oooooh, another first for me to try! Since I’m on a sugar-free diet, I’m going to try this without the Maple Syrup…thanks, Angela, for a delish-looking dessert that’s healthy (oxymoron!. Nope!)! I think I’ll sub Hemp seeds for rice crisp to up Omega-3’s. This fudge had solved my dilemma about wanting to give my kids chocolate treats at night but not being able to since they go haywire. They both love chocolate, but the combo of the caffeine in the chocolate and sugar means they won’t go to sleep, which means I cannot go to sleep. They both love this fudge and don’t notice the difference between carob and chocolate. Instead of maple syrup, I used agave, which is lower on the glycemic index so shouldn’t lead to add much sugar highs. Agave is 1/2 the price of maple syrup for me. I actually flavor it with a little maple extract so it tastes like maple syrup. Hey! I’d love to make this but I can only get my hands on carob chips. How many cups of carob chips would you as a substitute? Has anyone tried this? 1/3 cup? Hi, I’m allergic to cocoa (which is why I am after a carob recipe). Would this fudge work without adding the cocoa powder? Thanks. The frosty sounds delicious, although I can’t eat bananas,. What do you suggest as a subsitute? These were so good I will never be out of any of the ingredients. My mother in law has had many of carob fudge and says this was the best she’s ever had. If I wasn’t so tired from pregnancy I would have already Made and eaten this again three times over. The only thing I didn’t have was the crispy cereal, but I subbed slivered almonds. I did leave out the cocoa powder. To call it raw is not right since teh rice crisipies probobly have been processed in a very high temperature. I can’t have cocoa…can I put extra carob? Hey Danielle, I can’t see why not! Wowsers soon good! and so easy. I used all carob (no cocoa) and added just a touch more salt. I also added more brown rice crisp cereal. What I love about this dessert is that it is quite quick to make and difficult to mess up. I accidentally added extra maple syrup and thought it would not set but no problem. Had a friend’s (who is gluten free) going away party and the person hosting it did not make a GF dessert for her. I was able to start this and finish it ready to take it out the door in under 30 minutes. I also paired it with fresh pears and it is divine… Thank you so much, this is my go to last minute dessert. If you are caught unawares and have to make a last minute and GF dessert, you can make this put it in a pyrex dish run out the door and place it in a friend’s freezer and it will be ready long before you get to dessert. I am sure you could even pack in it ice and have it mostly ready to go. I subbed coconut flakes for the rice puffs and omgggg it was heavenly!! !